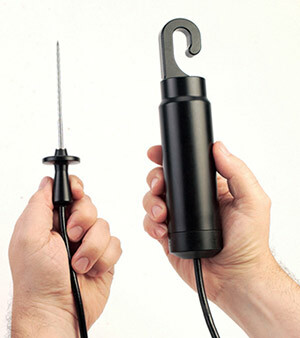 The OM-CP-RFOT is the most advanced wireless temperature data logger in the meat industry today. Its rugged design, equipped with a flexible piercing probe allows it to be used in the harshest environments. The OM-CP-RFOT is perfectly suited for smoke houses, ovens and other cooking processes up to 212°F (100°C) as well as refrigerators and freezers down to -20°C (-4°F). It is completely splash proof and can withstand wash down cycles. This state-ofthe- art device records and transmits internal product temperature readings back to a central computer for instant real-time monitoring. The OM-CP-RFOT never needs to be connected to a computer as it has been designed for two way wireless communication. Full communication can be performed directly from a central PC. In addition to wirelessly transmitting data, the OM-CP-RFOT also stores each reading to internal memory for backup. This back up data may be retrieved wirelessly at a later time. This easy to use software features user programmable critical control points, called “cooling flags” to assist in compliance with USDA Appendix B. The “cooling flags” are automatically annotated on the graph and tabular data views. The summary tab provides the cool down duration between each critical control point. The data can also be automatically exported to Excel® for further calculations. Data retrieval is simple. Plug the device into an available USB port and our easy-to-use software does the rest. The software converts a PC into a real-time strip chart recorder. Data can be printed in graphical and tabular format or exported to a text or Microsoft Excel file. The OM-CP-RFOT was designed with our customers in mind. We offer free firmware upgrades for the life of the product so that data loggers already deployed in the field can grow with new technological developments. Units do not need to be returned to the factory for upgrades. The user can do this automatically from any PC. 참고: Comes complete with 3.6 V lithium battery. Operator’s manual, Windows software and USB interface cable are included with the OM-CP-RFC1000-EXT wireless transceiver package (required to operate the data logger, sold separately).